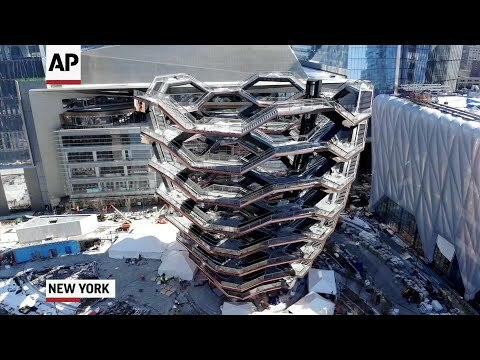 NEW YORK (AP) — A towering sculpture called Vessel — made up of 2,500 twisting steps the public can climb — is scheduled to open Friday as the visual centerpiece of Hudson Yards, a $25 billion urban complex on Manhattan’s West Side that is the city’s most ambitious development since the rebuilding of the World Trade Center. When fully complete, the 28-acre (11-hectare) site will include 16 towers of homes and offices, a hotel, a school, the highest outdoor observation deck in the Western Hemisphere, a performing arts center and a shopping mall that also opens Friday. About half the complex is complete, with the rest scheduled to be done by 2025. The opening of the $200 million Vessel and the landscape around it will likely bring a wave of tourists to a rebuilt corner of the city that was previously characterized by a huge rail yard, parking lots and weedy sidewalks once known as a cruising ground for prostitutes. The 3,200-ton structure was assembled from steel-and-concrete pieces manufactured in Monfalcone, Italy. Accommodating 600 visitors at a time, it’s 150 feet (46 meters) tall and rises from a narrow point at its base to a width of 150 feet at its peak. Admission is free, but people can get timed tickets in advance to avoid a line to enter. The developers, including Miami Dolphins owner Stephen Ross, have billed their project as the most expensive private development in U.S. history. High-power tenants planning to move into Hudson Yards office space include CNN, WarnerMedia, Wells Fargo and the BlackRock money manager. The luxury goods maker Coach is already operating there. About 60 percent of nearly 300 luxury apartments on the market have been sold, with hundreds more coming up. The observation deck is set to open later this year on the 100th story of one of the city’s tallest buildings. 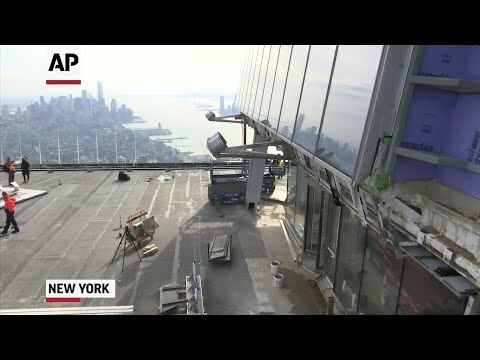 The wedge-shaped deck will be 100 feet (30 meters) above the one on the 86th floor of the Empire State Building, with a bird’s eye view of the New York skyline and the Atlantic Ocean. The arts center, a 200,000-square foot (18,580-square meter) building called The Shed , is scheduled to open April 5. It includes an outer shell that can deploy over an adjacent public plaza on huge wheels to expand the size of the performance space. Also opening Friday is a seven-story mall called the Shops at Hudson Yards, with more than 100 stores offering brands from Cartier, Stuart Weitzman and Manhattan’s first Neiman Marcus to chains like H&M and Zara. There will also be a slew of dining choices including a Shake Shack, Neiman Marcus’s signature Zodiac restaurant and celebrity chefs’ restaurants. Hudson Yards is part of a stretch of construction along the Hudson River from Columbus Circle to the World Trade Center that is gradually nudging New York’s power-and-money epicenter west from midtown Manhattan. Make no mistake, Hudson Yards is aimed mostly at residents with deep pockets — one-bedroom apartments are renting for more than $5,000 a month, about $2,000 more than the average Manhattan one-bedroom apartment. A two-story penthouse is selling for $32 million. And although 10 percent of the residential space has been reserved for affordable housing, that applies to people whose annual income is still above poverty level. It took decades for this real estate saga to take shape. Former Mayor Michael Bloomberg had wanted the West Side rail yards to become the site of a domed stadium that could host the 2012 Olympics and later be a home for the NFL’s Jets, but political and logistical hurdles ultimately killed those plans in favor of a mixed-use, commercial and residential neighborhood. The developers broke ground on the project in 2012, building over the tracks of the Long Island Rail Road that connect with Penn Station, the city’s busiest transportation hub. In an impressive engineering feat, massive columns support a platform surrounding the buildings and covering the tracks. To lure investors, Hudson Yards is getting a government tax break plus other assistance running into billions of dollars that also financed the extension of a subway line.